Sagit is an applied criminologist, specialising in the profiling and the psychology of terrorism. She is has completed her PhD thesis titled- ‘The Social-psychology profile of terrorist leaders in Israeli prisons’ at King’s College London University, in 2013. 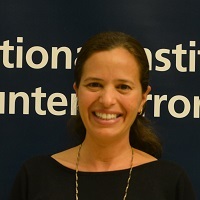 Her work involves years of researching and teaching the mind-set and conduct of individuals and groups involve in terrorism and political violence. Sagit is a Research Fellow at Institute of Counter-Terrorism (I.C.T. ), Inter-Disciplinary Centre, Herzliya, Israel, and also joined ICSR- International Centre for the Study of De-radicalisation, at King's college London as an Atkin Research Fellow in 2009.